ABC Bullion received the following email from a refinery partner this week as a general warning to those in the bullion industry. 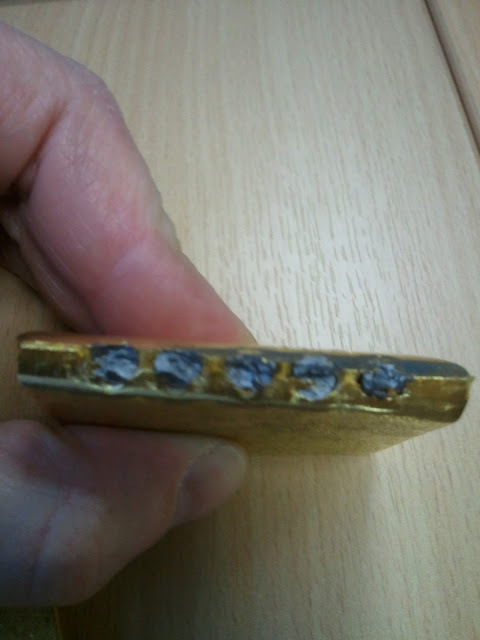 ABC Bullion did not purchase this bar, the bar was bought by a dealer in the UK that has no connection to ABC Bullion, the email and photos were sent as a general warning. The bar is a "one off"
I have xxxx'ed out the city's name to avoid any second guessing as to the name of the dealer. Attached are photographs of a legitimate Metalor 1000gm Au bar that has been drilled out and filled with Tungsten (W). This bar was purchased by staff of a scrap dealer in xxxxx, UK yesterday. The bar appeared to be perfect other than the fact that it was 2gms underweight. It was checked by hand-held xrf and showed 99.98% Au. Being Tungsten, it would not be ferro-magnetic. The bar was supplied with the original certificate. The owner of the business that purchased the bar only became suspicious when he realized the weight discrepancy and had the bar cropped. He estimates between 30-40% of the weight of the bar to be Tungsten. This is very worrying and reinforces the lengths that people are willing to go to profit from the current high metal prices. Please be careful. the other thing is how do people know if they got tungsten bars? if even the tools and scaners gives them 99.9% Au? Actually 2g on 1000g bar is huge, particularly underweight by 2g. To prove my point I went and weighed two Australian made ABC 1kg gold bars today. One weighed 1000.01g the other 1000.02g, compared to 2/100th of a gram 2 grams (200 x 1/100th of a gram) is a huge error. The best way to avoid dud bars is to buy from established dealers who certify the purity of their bars and offer to buy them back. Re: 2 grams missing. That's not the story fool, read it again. It's 30 to 40% of 1000 grams of gold missing. At around 50+ bucks a gram, that's over $15,000 to more than $20,000 of missing gold per bar. The two grams missing was probably because it was impossible to drill out the original bar and then perfectly fill the void with tungsten. The two gram discrepancy caused the owner of the bar to delve deeper. Next question, how did they cover over the end of the bar to hide evidence of the drill and fill? I actually have 3 bars...I better go weigh the damned things!!! I would be very surprised if they are underweight. 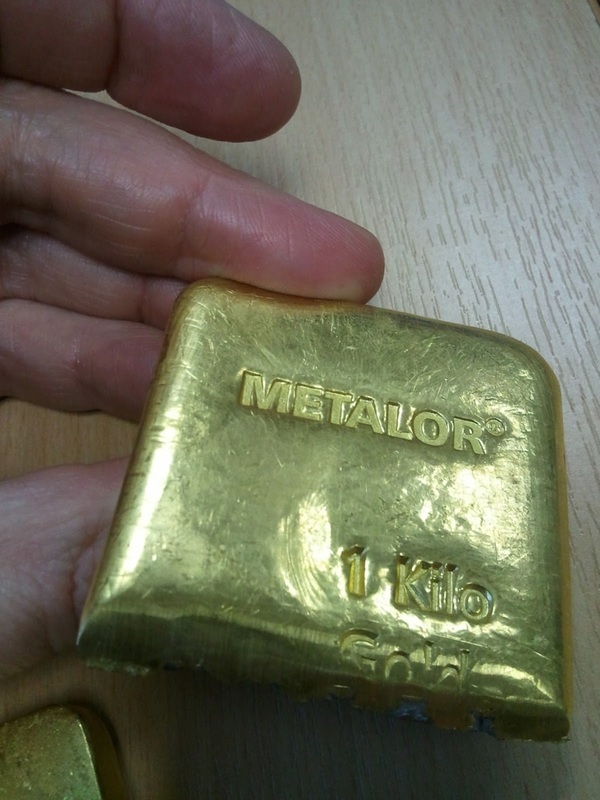 A good quality 1kg gold bar should weight approx 1000.01g - 1000.05g (as mentioned above). Make sure you are using a highly accurate electronic scale. Anyone know the feasibility and costs involved in doing this on a smaller scale? Say one ounce coins. For bars, especially LGD bars, I can imagine this to be feasible. On coins, I'm not so sure. It is much harder filling up a minted coin than filling up a 1 kg casted gold bar. Imagine a Kruegerrand. Drilling holes in it and hiding those holes should be really difficult. Coins mostly are minted/casted from other metals than gold. Better fakes are gold plated for a better look. The pictures are interesting. From the views of the cut, it appears that the diameter of the tungsten rods are nearly equal to the height of the gold bar - there isn't a lot of space between the rods and the top or bottom of the bar. How did they manage to drill original, stamped bars so close to the surfaces and avoid breaking through where the surfaces were stamped? Are any pictures available of the (sealed) ends of the bar? I'm curious as to how well they managed to conceal the drill holes. They are not really that close to the outside of the bars, the cut was made by a shear which will compress the outside of the bar by force until the cut can be made.Similar to cutting with scissors. A 1 kg gold bar with 2 grams missing should set your alarm going off. Bars always should be somewhat heavier than their nominal weight. Because no customer will complain if a bar has an overweight of 0.01 gr. It would be interesting to see pictures of the front sides of the gold bar. Any signs where the tungsten rods were inserted? Yes it should set off alarm bells. Actually many of our clients ask to weigh their bars before leaving the store to ensure peace of mind. No bar has ever been underweight. Faked, fake gold pics - interesting. Don't think so though. Hi Warren, no updates. Although I can assure you that we received the email from people that we deal with on a regular basis, so the email was real. They in turn they were dealing with someone that had some existing connection. Whilst this does not 100% prove the pics were real all parties in the chain of the email exchange knew each other. There was a story several years ago about tungston filled gold bars during the Clinton administration which were sold to China. . If that one got through one can wonder how many there is out there? I suspect very few bars like this are out there as second hand bars tend to get re-refined to be made into a other size/branded bars or used by manufacturing jewelers. We would soon hear about it if it was a more common occurrence. The fact that this story has made news around the world with over 100,000 views in different publications shows how rare such bars are. Tungsten weighs almost the same as Gold. Thanks for the chemistry chart data, W is to Au as Mo is to Ag. But as yet I've heard no news of counterfeit Silver bars. Both are cheap as chips compared to "my precious". An XRF will only register the surface as it reads the radiation return from the surface. That piece of gold was not good enough for Jehovah. Nail 'em up. amazing and very knowledgeable post. You can also buy gold online now as there are a large number of websites which put up offers like 1 oz Gold Bars for Sale at the lowest premiums. Comments made on this website are an expression of opinion only. Whilst I try to explain the possible benefits of investing in precious metals, you should not construe comments, links or advertisements on this website as recommendations to buy or sell a commodity at any time. I recommend you consult with your qualified investment advisor, before you make investment decisions. Please be aware that authors of material on this website may have invested, or may from time to time invest, in commodities discussed on this website.